If you're been reading our blog for a while, you know we REALLY like hands on projects, especially art ones. 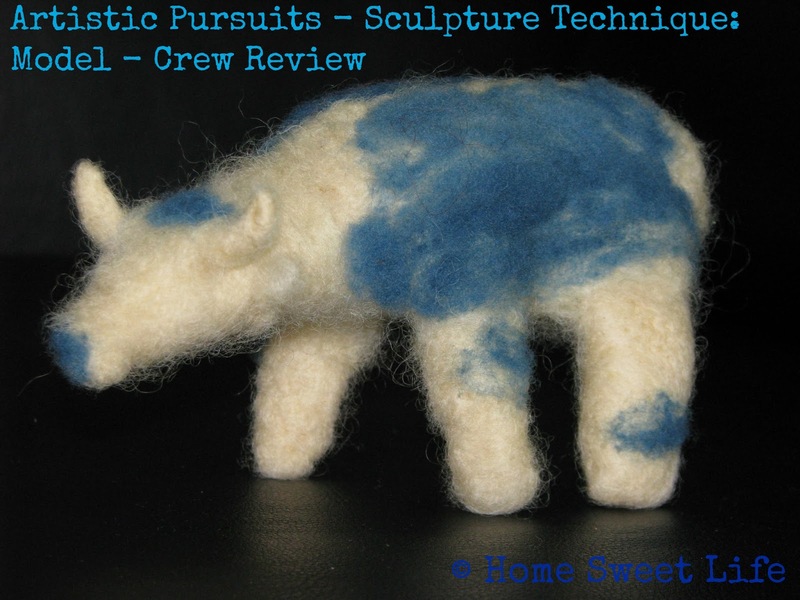 So we were thrilled to be chosen to review one of ARTistic Pursuit's newest books! 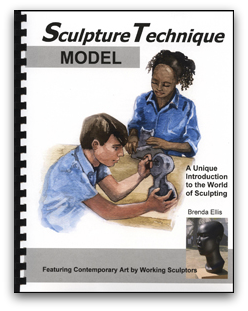 Sculpture Technique: Model is a fabulous book for learning about sculpting with Putty, Clay, or Wool Fibers. This book is a little different from other ARTistic Pursuits books you may have, in that it is divided into three separate units (one for each kind of medium) and allows the student to start in any of the three areas. This book also differs from previous titles by Brenda and Daniel Ellis of ARTistic Pursuits in that it does not lend itself to short time slots. While doing almost any type of sculpting, you need to follow the timeline of your material, not just a clock. If there is a point in the project where the student need to pause and let the material dry, there is a little hand that signals "STOP." 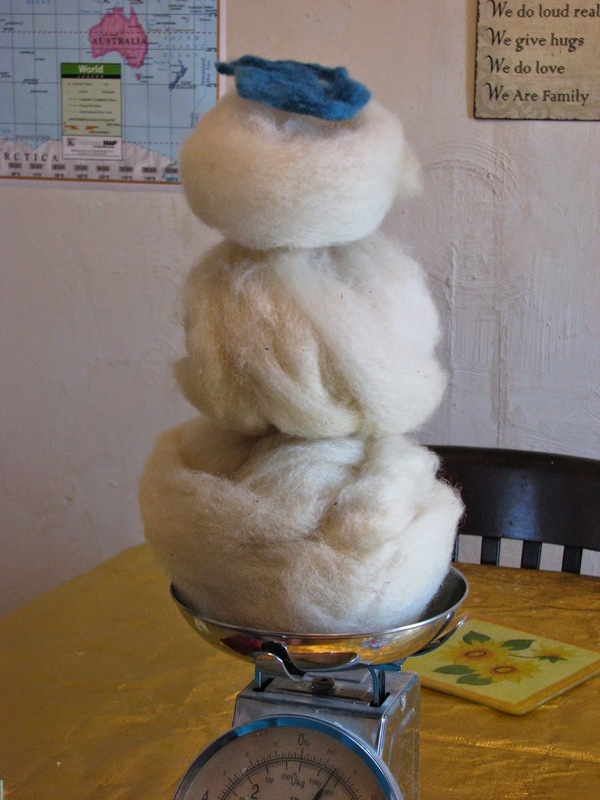 The wool roving snowman - LOL! 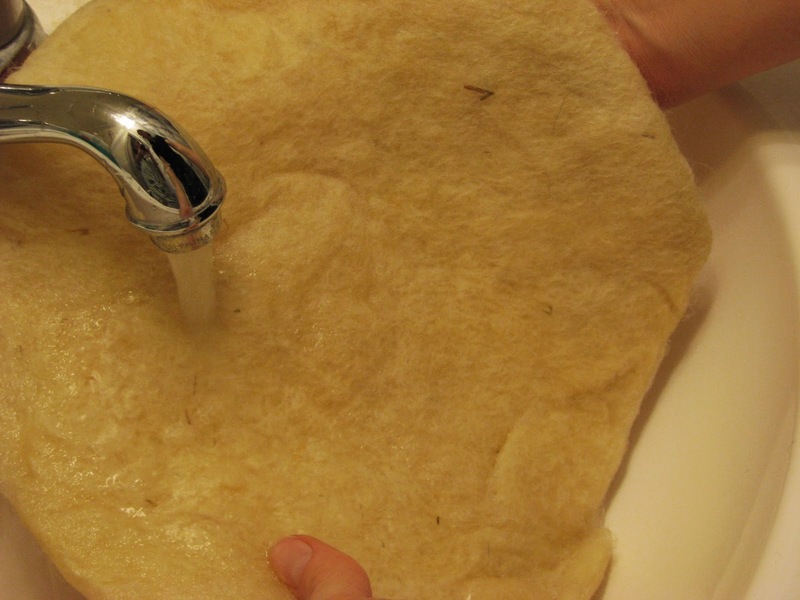 Our girls really wanted to start with 'unit 3: creating surface with fiber.' Each unit begins with information for the students to read that helps them think about the medium they will be working with, along with a property they will be focusing on. 'unit 1:creating mass with putty' talks about "mass" and then goes on to give equipment and safety advice for working with putty. 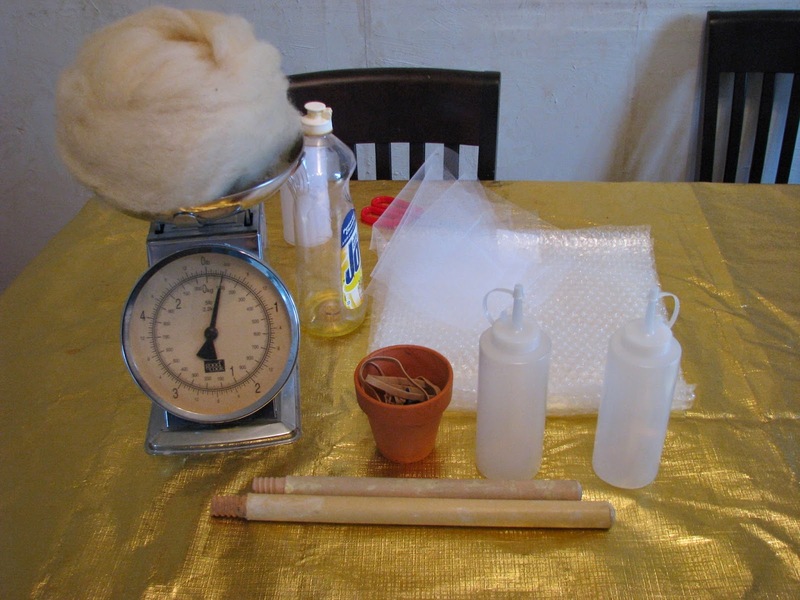 'unit 2: creating scale in clay" talks about "scale," and then continues with instruction in the properties of clay, and how to modify household items to make your own inexpensive tools for working with clay. 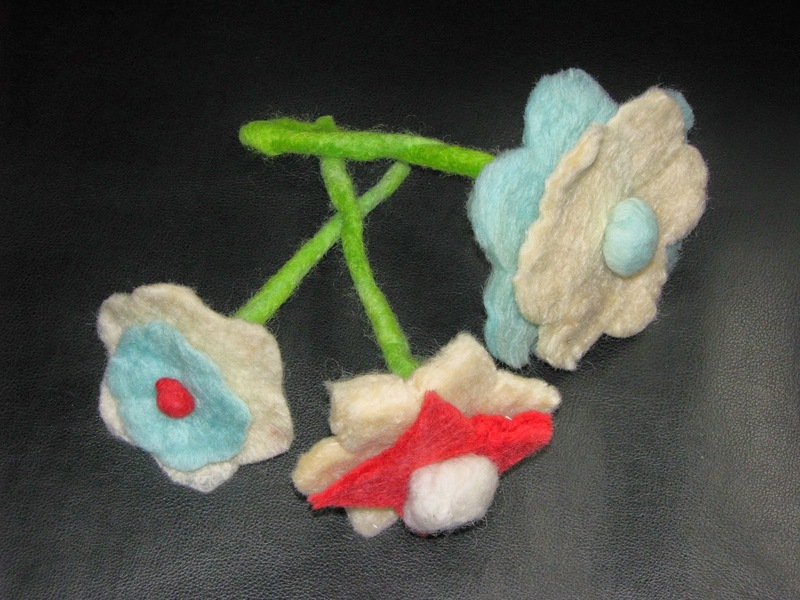 Unit 3 focuses on "surface" and includes lessons on the color wheel and the differences between wet felting wool and needle felting. 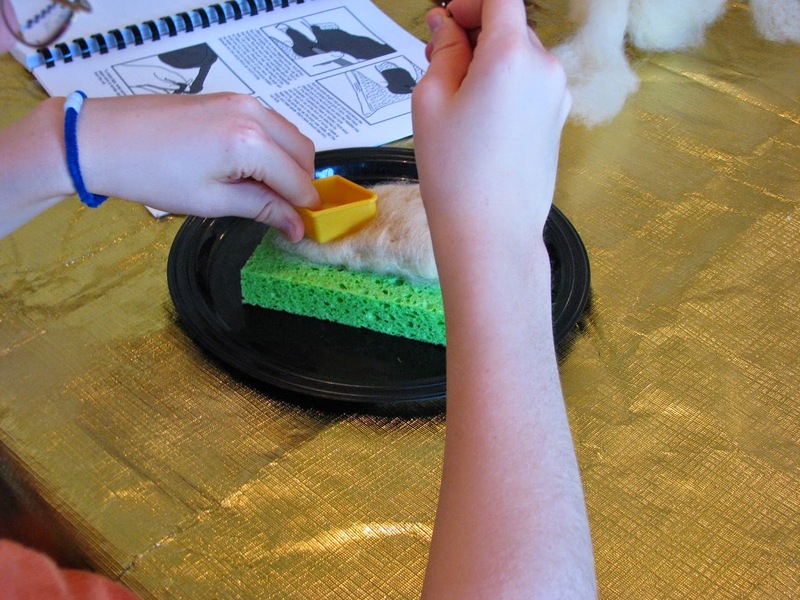 While Sculpture Technique: Model is geared for ages 11-18, the wool felting may be the hardest unit, and is probably better used with students who are at least 13. One of the things I like the most about ARTistic Pursuit's books are that they are non-consumable, so you can use them over and over (and you will WANT to!) Sculpture Technique: Model retails for $47.95, and will definitely fill a year (or more) of your student's art class time. There is a suggested timeline in the back which gives you the outline to finish the book in 36 weeks. The back of the book also has some great resources, like an essay by Daniel Ellis "The Road to Creativity," and suggested grading guidelines. I personally would hate to have to assign a letter grade to an art project, but the reality is that most of the students using this book will need some sort of grade for the course for their transcript. This makes the grading suggestions REALLY helpful. The Ellis family reminds you that the majority of the student's grade should come from finishing their projects, with only part of the grade coming from written or oral answering of the self-evaluation sheets at the end of each unit. unit 3 begins with 'create felt sheets.' [Note: the units are not capitalized, nor are the sections, so I'm trying to include them just as they appear in the book.] 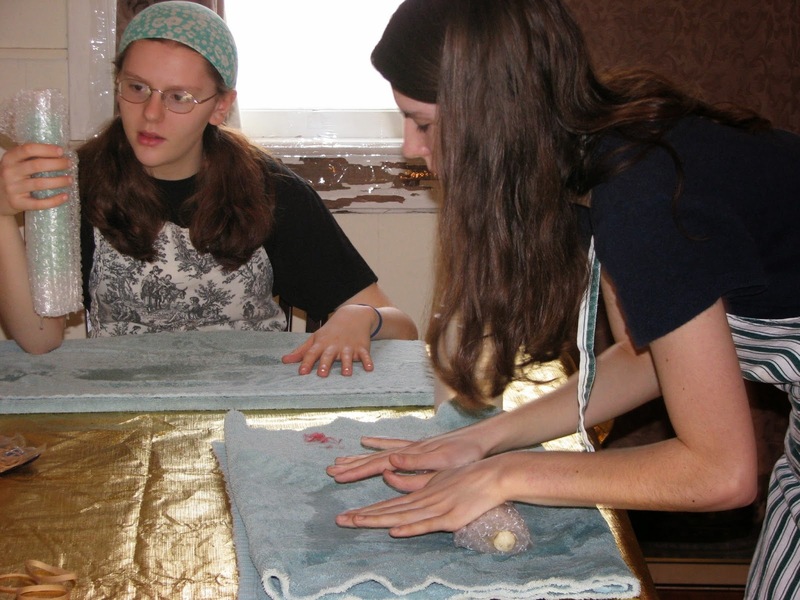 This first section taught the girls how to prepare their wool roving, felt it by hand, and then pre-shrink it by the fulling process. 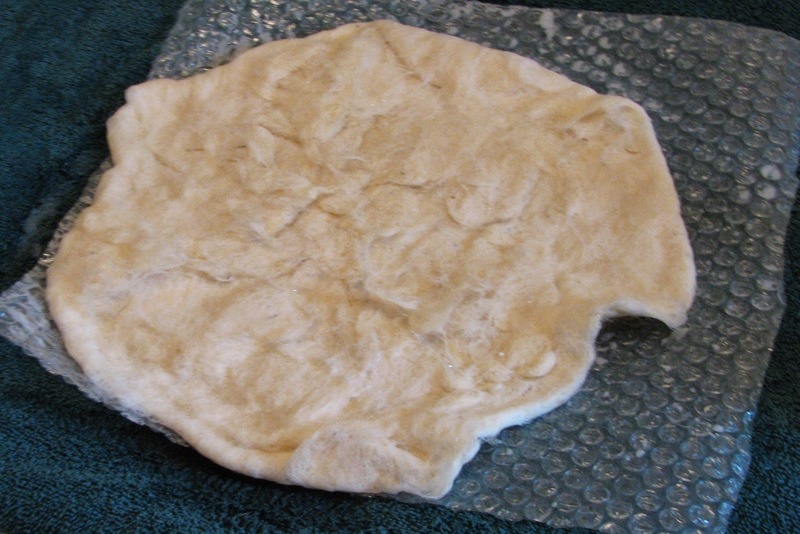 When we were done, Emily (age 15) said our wool looked like tortillas. She was right! 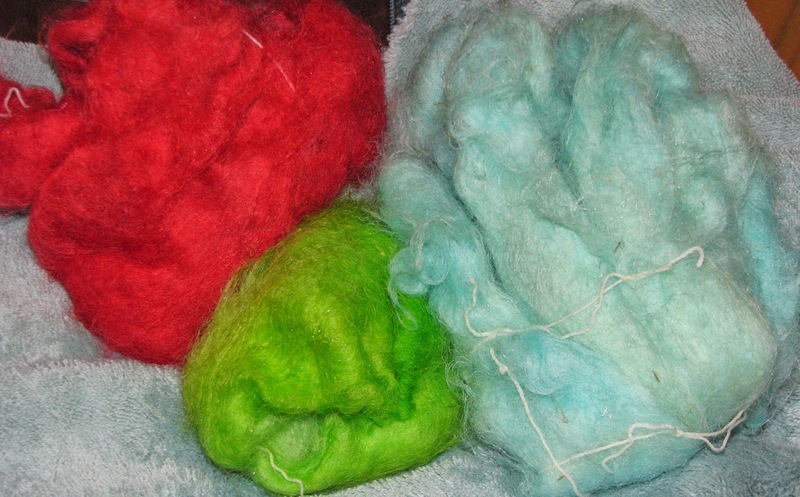 Next came felting... it's hard to get a picture of that - they're always moving! 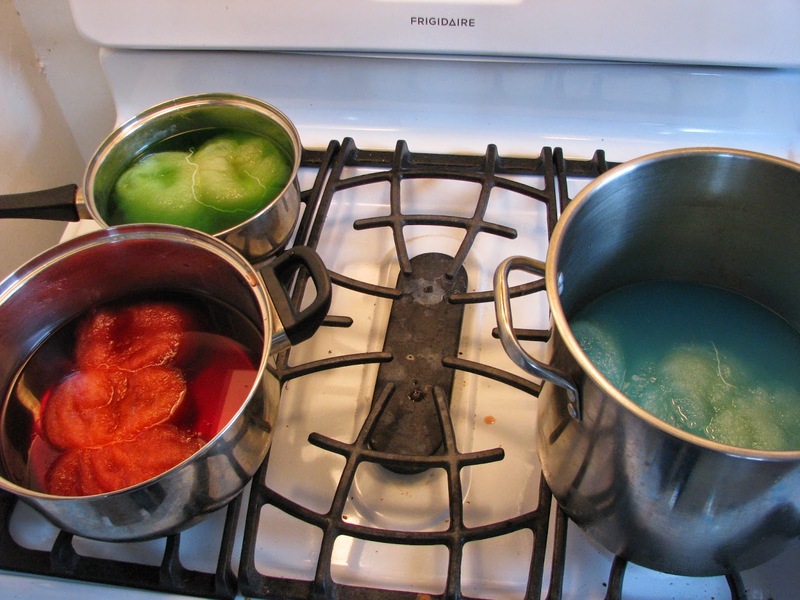 Then we went into the kitchen and dyed some of the roving so we would be able to make colored sheets of wool felt during our next session. 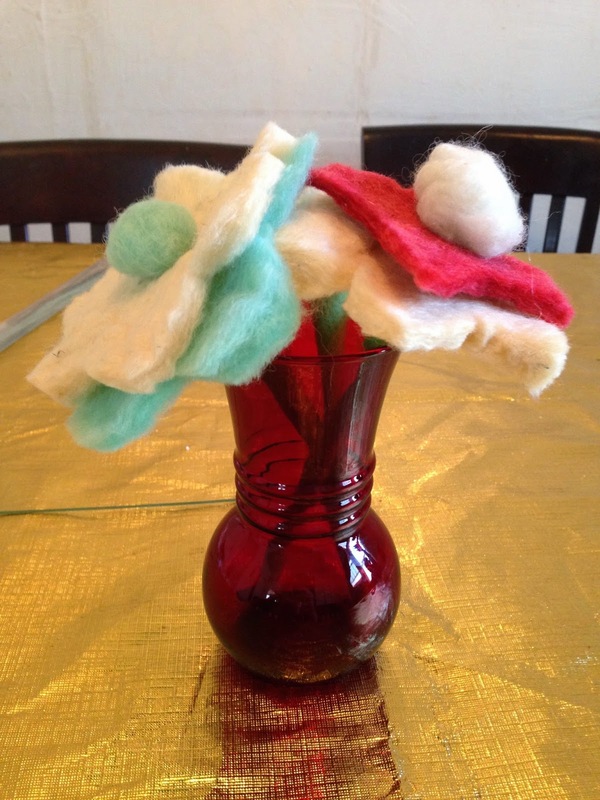 Arlene (age 13) and Emily chose different colors to use so their finished projects (flowers) would look unique. 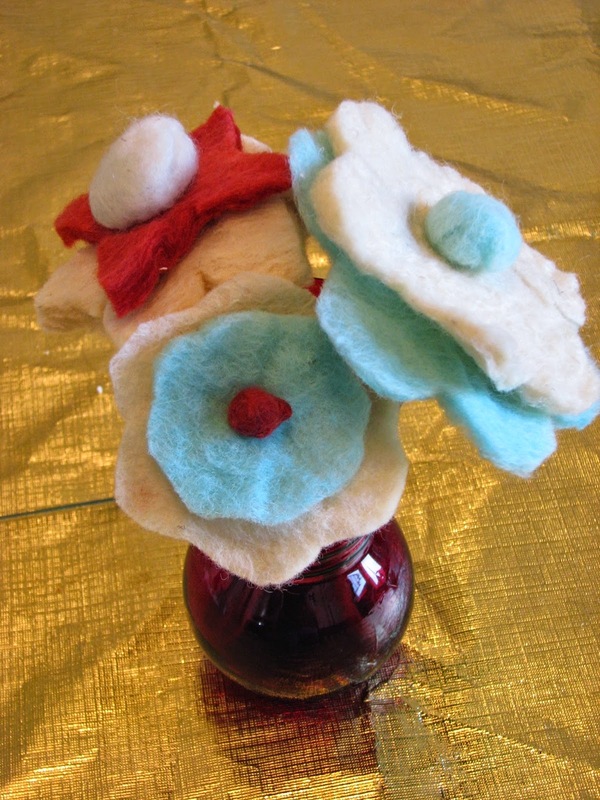 The next section 'create a sculpture - With Felt Sheets' taught us how to use our wool felt tortillas and make flowers. This was a lot of fun, but needed about 2 more hands than we had... and then Grandma arrived and became the official 'hold this' girl. That was providence! Each of the three of us made a flower, and each is unique. 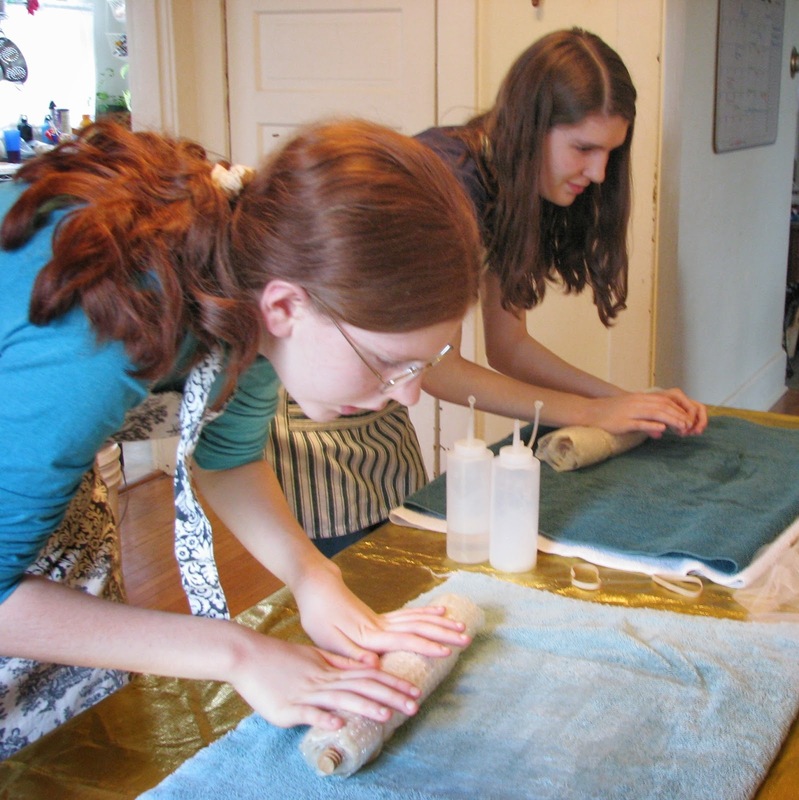 There are other suggested projects in this section using the wet felting techniques, and while we may go back and work on them later, the girls REALLY wanted to try needle felting, so we moved ahead. 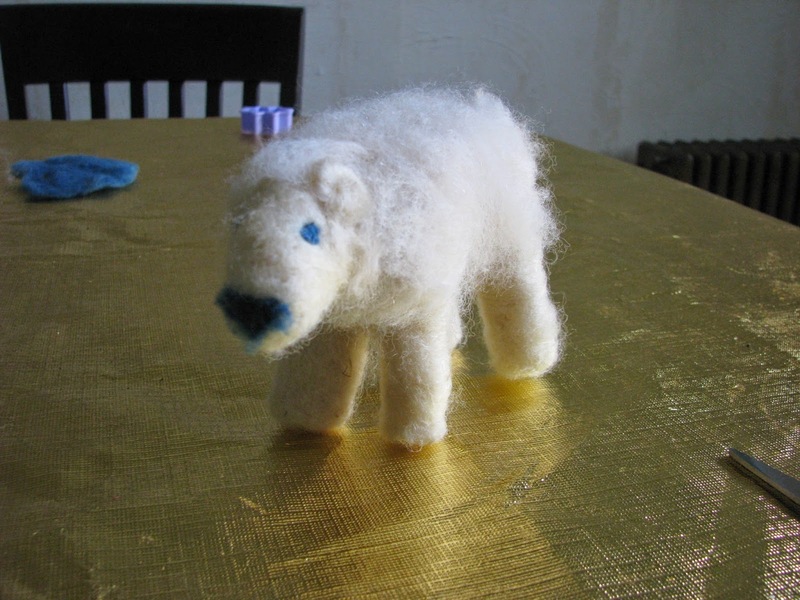 Encourage your student that it takes time to learn how to needle felt, and not to be discouraged with their first results. 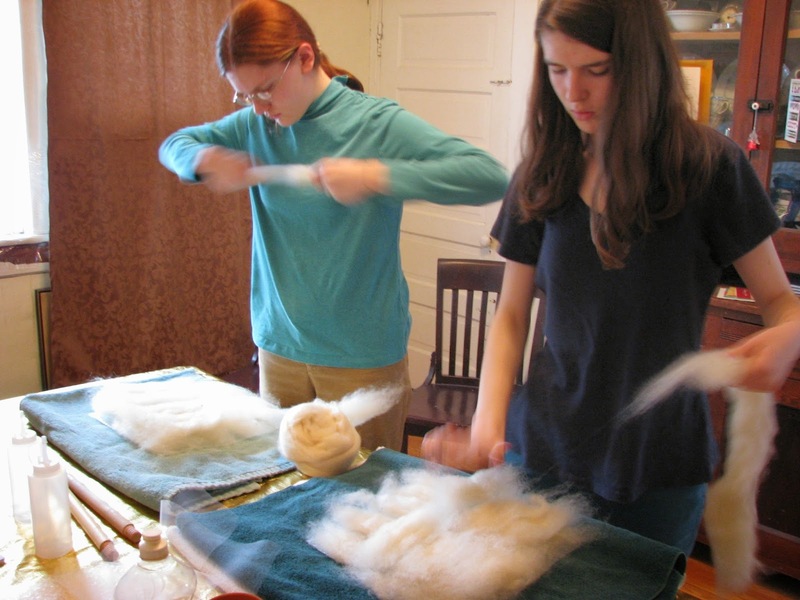 With each time we worked on these projects, the girls' techniques improved and they really began to understand HOW the fibers in the wool react to the felting process. Right after the bird project comes a focus on appendages (think legs) and surface design. The girls were really, really excited about this part. 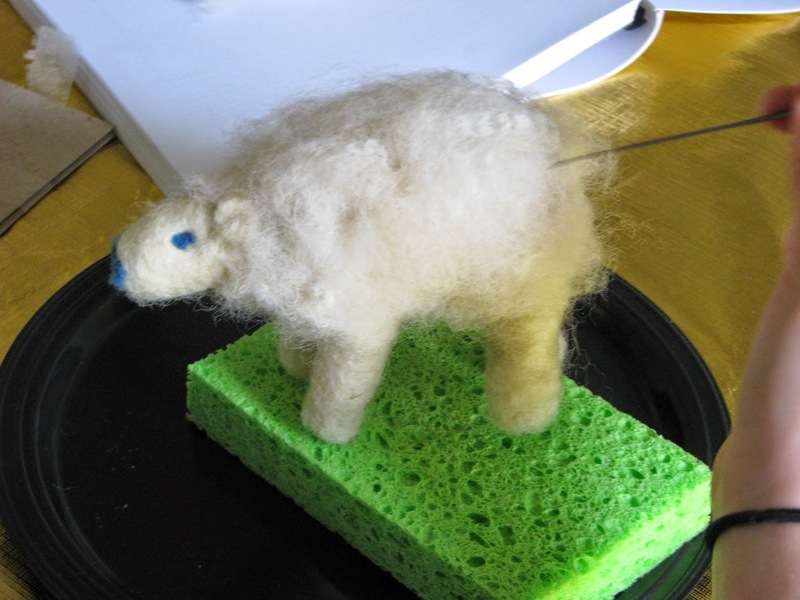 Arlene wanted to make a sheep to give to her mentor Sue, and Emily wanted to make an Ox to give to her Ag mentor Kevyn. 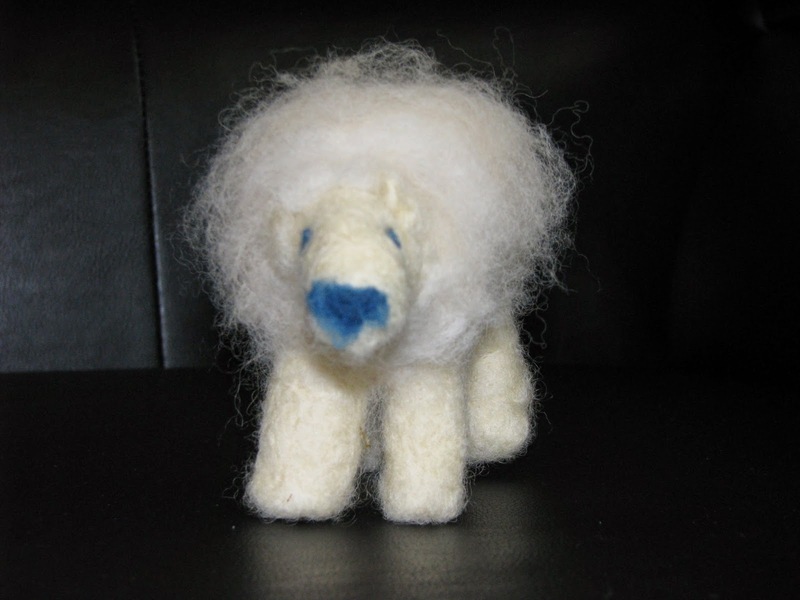 Make it a fluffy sheep! These were NOT easy projects, but the girls worked and worked on them until they were to their satisfaction. 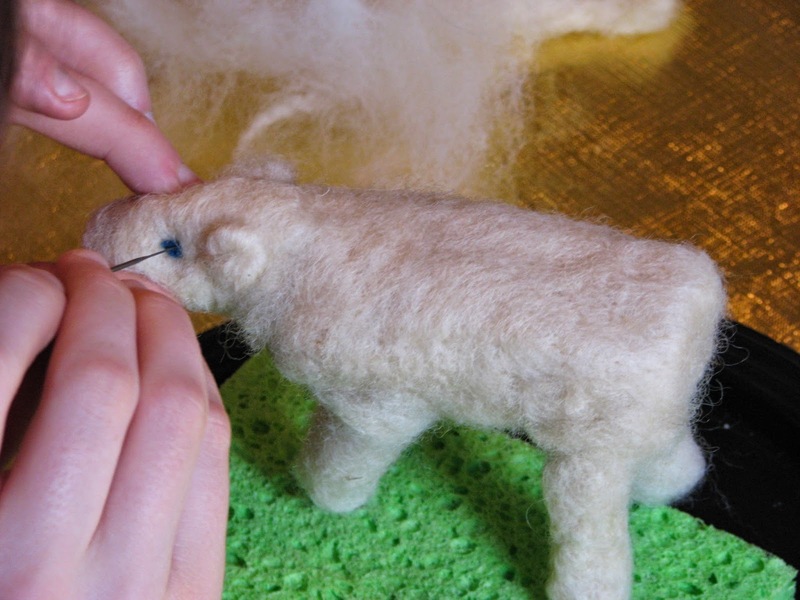 Arlene decided her sheep was not fluffy enough, so she lightly needle felted on some llama hair that we had been given to make it extra fluffy. 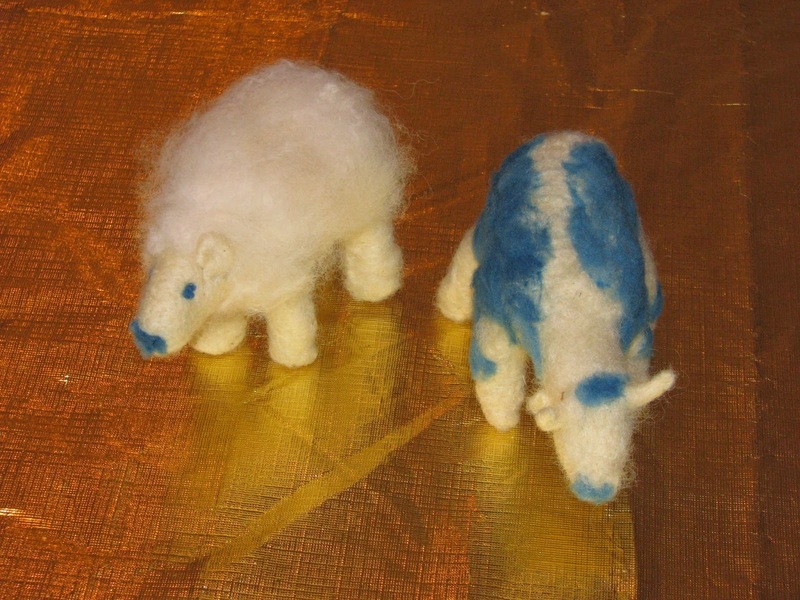 Emily patterned her ox after one of the ones Kevyn works with every week, Blue, from Conner Prairie. He is a Randall Lineback if you want to google the breed. Can I just say again... we LOVE this book! We are by no means finished with this unit. Both girls want to make more animals, and so do I.
I think we will continue in this unit for the rest of the school year, and save the other two units for next year. The book is well written, both in information about the various mediums and planning your projects, AND in the instructions. The book contains both color photos, and black and white illustrations to make sure you understand what is being asked of you. 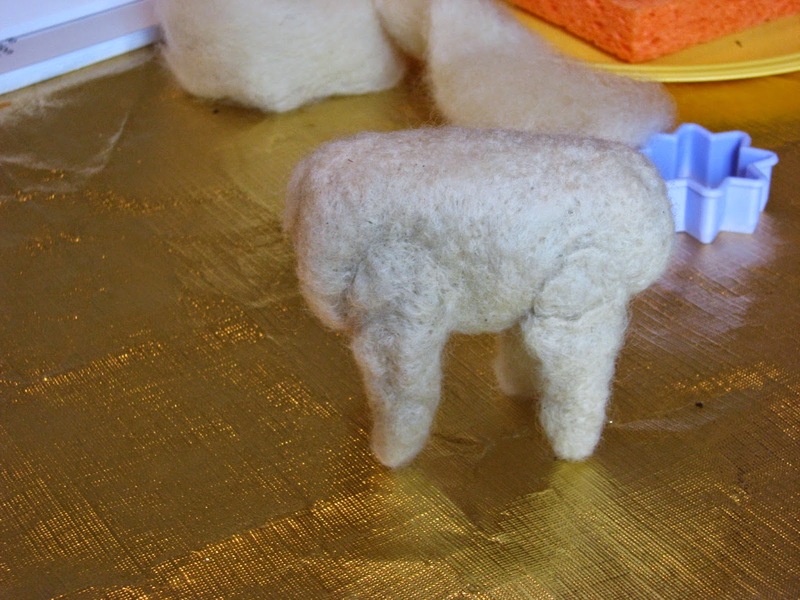 While watching the girls work on their sheep & ox, I was contemplating what I wanted to make. 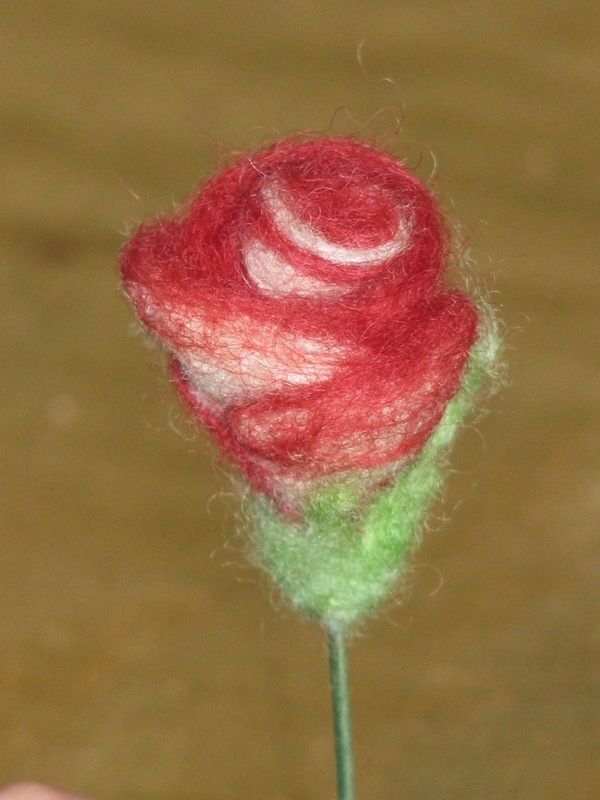 Both girls quickly learned how to manipulate their wool to get the desired effects on their animals, and I wanted to do something they weren't already doing... so instead of an animal, I decided on a needle-felted flower. 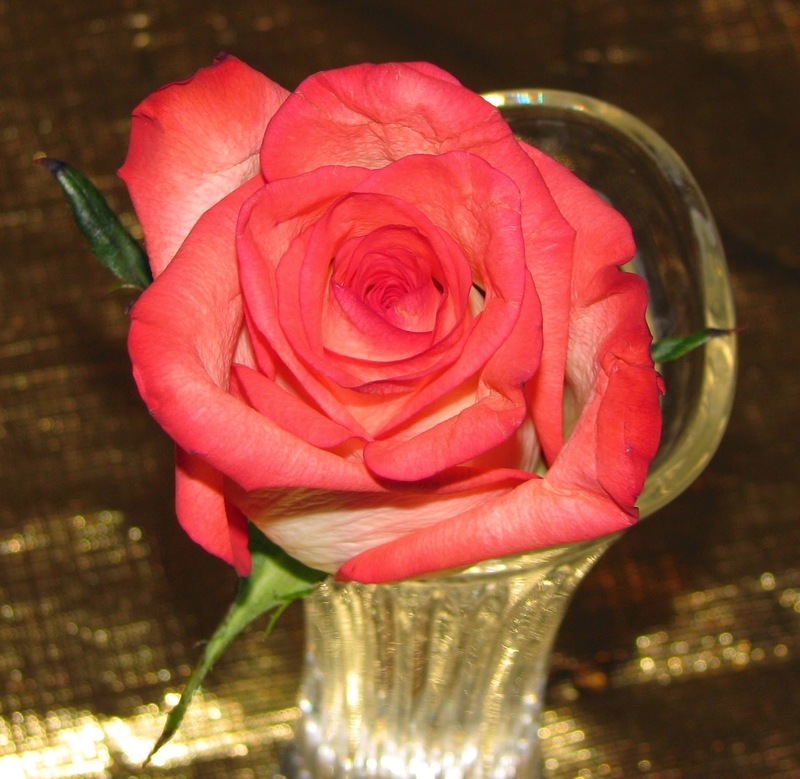 I had received this rose last week, and the coloring intrigued me. I though about it over the weekend while I was away from the materials, and I came home and made the rose below from the left overs of our previous projects. 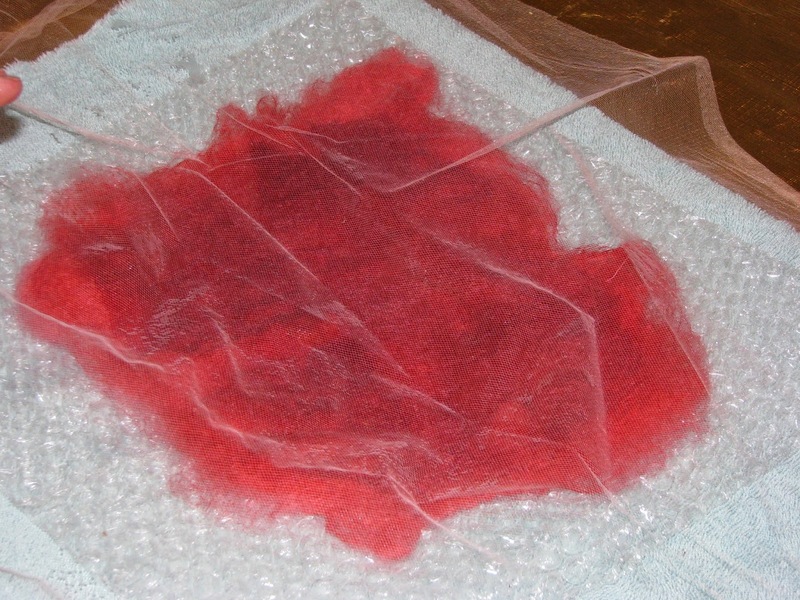 I combined the wet-felting sheet leftover pieces with the needle-felting techniques and I am satisfied with my results. I think it is lovely. While most people think of ARTistic Pursuits as a homeschool art company, I would love to see it used in summer camps, after school art programs, and in traditional and/or private schools. Each book I have seen is written TO the students, with information to help the instructors, whether they've ever done anything with art before of not! Other Crew members reviewed both this Sculpture book & the other new one, Sculpture Technique: Construct, as well as the Preschool and Elementary books from ARTistic Pursuits. Click the banner below to read all the Crew Reviews! Did you find and identify the nine different kinds of flowers that are visible in the flower find picture I posted yesterday? Take a look below and see how you did! 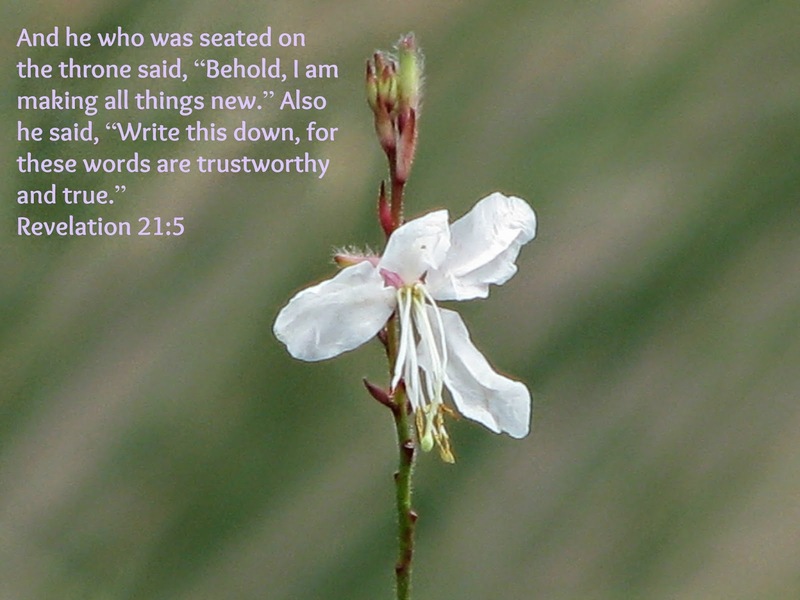 Thankful Thursdays - 4/24/2014 - Spring Flowers! 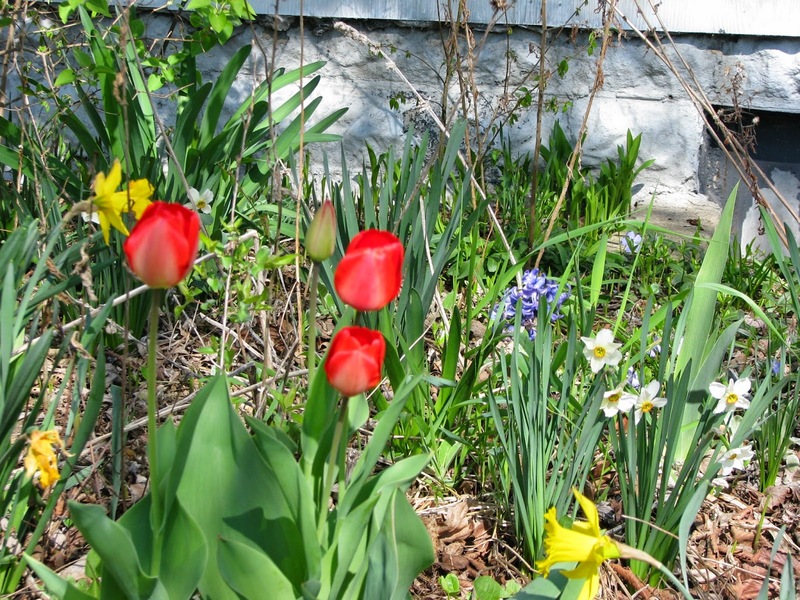 Today I am thankful to look around our yard and see lots of Spring flowers! That means at least the average temperature is on the rise. It also means there are more hours of daylight each day. I'm also thankful to be taking the rest of the week off... so to keep you occupied, I've taken a quick photo of some flowers that kick off Spring in our butterfly garden. No, these aren't all for the butterflies - after all, they need it to be 70 degrees and we're not there yet. So- this is a hidden picture game for you. 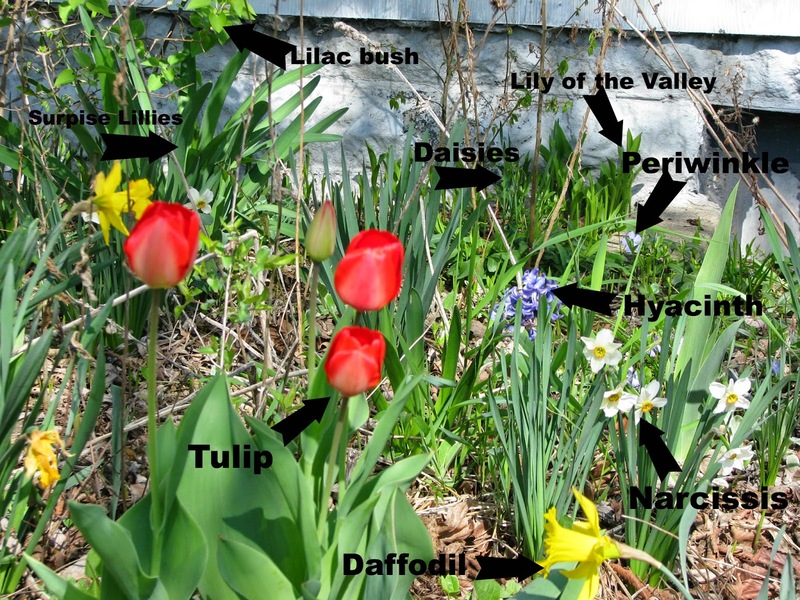 Come back tomorrow and see if you found all of the flowers (5 are blooming, and the other 4 you'll have to find by their foliage,) and correctly identified them. Tomorrow I'll post the answer picture. 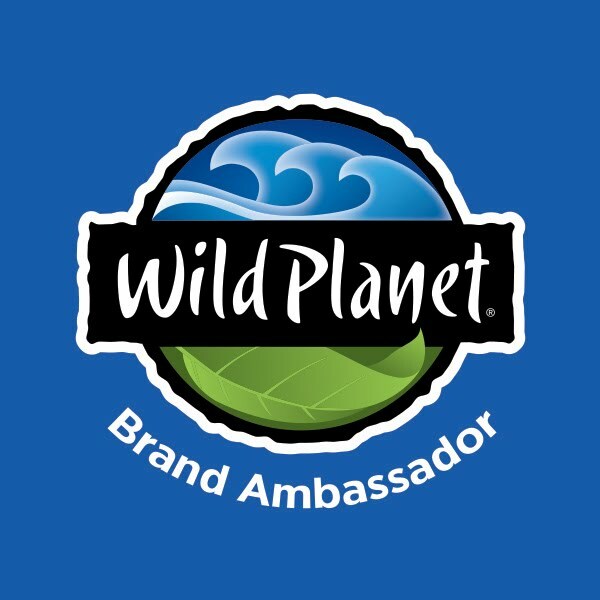 Many of you may be familiar with Home School Adventure Co. because of their Philosophy Adventure curriculum. Arlene and I had the chance to review one of their other great products, the Mere Christianity Journal. 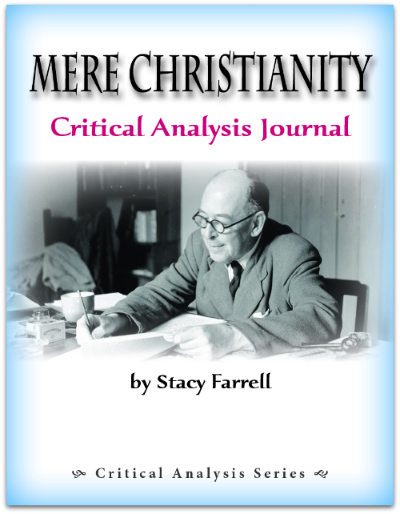 This journal is full of questions to help you process and discuss the various parts of C.S.Lewis' Mere Christianity book. In case you haven't read Mere Christianity I want to give you a little background about the book, and tell you why I think this Critical Analysis Journal is such an asset. Lewis' book is a compilation of talks he gave on the BBC during WWII. He was asked (as a recent convert to Christianity) to speak to the British people and help them understand the basic tenants of Christianity. While these talks were geared towards offering understanding and hope in a time of war, they still ring true for Christians today. Neither Arlene nor I had read Mere Christianity before the review, but we had both read several other books of Lewis' (Chronicles of Narnia.) I downloaded the Journal and printed several sections to get us started. The book form of Mere Christianity is divided into four sections (Book 1, 2, 3 & 4) and the journal follows along with questions for each chapter in each book section. We read two chapters in Mere Christianity, and then discussed and answered the questions in the journal. After that first day, we decided we should stop after each chapter and discuss and answer the questions one chapter at a time. None of the chapters in Mere Christianity are long, but because they cause you to think, and the journal wants you to put into words your answers, it's best to not rush ahead. 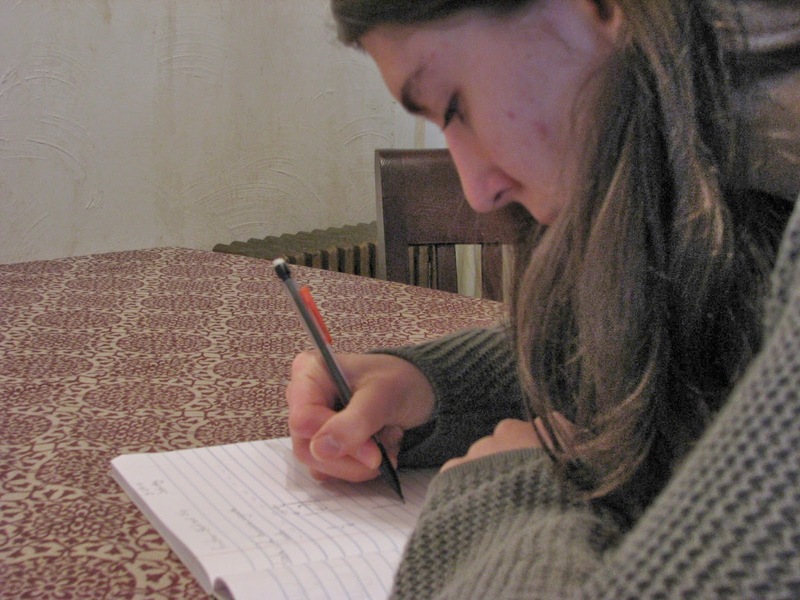 Arlene is almost 14, and could have done the journal all on her own, but I wanted to work through it with her. After just a couple days she said "Mom, you know I can do it on my own right?" Yes, yes, I know...I just wanted to spend time with my little girl. Then, Kurt became ill and I was glad it was something Arlene could do on her own. I still want to go back through the rest of Mere Christianity and the questions in the journal myself, but for right now, Arlene is moving along on her own. While the journal is recommended for ages 12 and up with help, your High School student can probably do it on their own. For the 12-15 yr old group, you'll need to evaluate two things: first- whether or not they understand WHAT Lewis is talking about, and second-are they understanding the questions in the journal. I would recommend working on this together with your teen, especially if they are a new Christian. Lewis does a good job of explaining each topic, but we've found the information is retained better if Arlene and I discuss each chapter along with her writing down her answers. When it comes to a journal, I prefer to print out the pages from the PDF and write with a pencil or pen, however, if you love to type your answers, you'll be glad to know that this Journal is an interactive PDF and allows you to type and save your answers right on your computer. 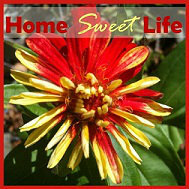 The digital download PDF retails for $18.95. At 185 pages you'll be printing a while, so consider your options. Print it all, print a section at a time, or choose to enter your answers on the computer. If this seems daunting, print editions are available for $28.95 each. You might want to consider using this journal for your small group, Sunday School class or co-op. The number of questions for each chapter varies, but it averages about a dozen question per chapter. I can see this being a great tool for a 'what we believe' type of study, either in a group of individually. If you use this Journal on your own, you will probably find yourself seeking out someone to discuss it with. It is though provoking and challenges you to look around you to see examples in your own life (& job) that relate to the examples Lewis gave in his talks. The four books in Mere Christianity include: Right and Wrong as a Clue to the Meaning of the Universe, What Christians Believe, Christian Behaviour, and The Doctrine of the Trinity. Because these each build upon basic principles of the Christian faith (and become more advanced) I would suggest you check in with your teen at least weekly as they use this resource. Even if they don't have questions they need help with in the first part, they may well want help later on. On a typical day (wait, our life is never typical...) ok, on most days, Arlene would read a chapter and then answer the questions in her journal. We would then talk about the section while making dinner, or while in the car running errands. I found this journal from Homeschool Adventure Co. to be an excellent tool to use alongside Lewis' writings to help the student understand the differences between world views. Just in the second chapter, Lewis gives examples that you can picture in your minds' eye that distinguish between Biblical and non-biblical world views. As your students learn to distinguish between the two world views, they can start to see where logical fallacies creep into many people's thinking. I appreciated Lewis' description of progress - not just changing, but changing for the better. Using this journal is bringing progress, it is helping us learn to be discerning, it is helping Arlene dig deeper into understanding what sets our world view apart. If you are wanting to work on your own critical thinking skills, this Journal could be a great tool for you to use. 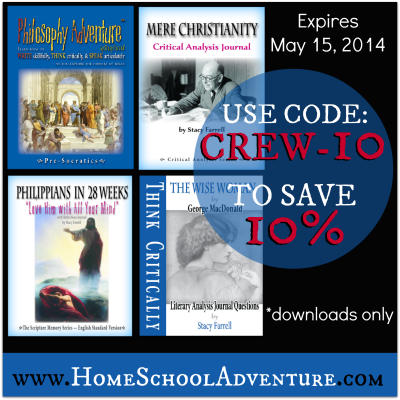 If you'd like to purchase one of the PDF downloads from Home School Adventure Co., they are offering a special 10% off through May 15, 2014. 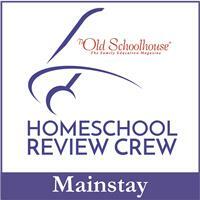 Crew members reviewed several titles from Home School Adventure Co., click the banner below to read all the reviews! 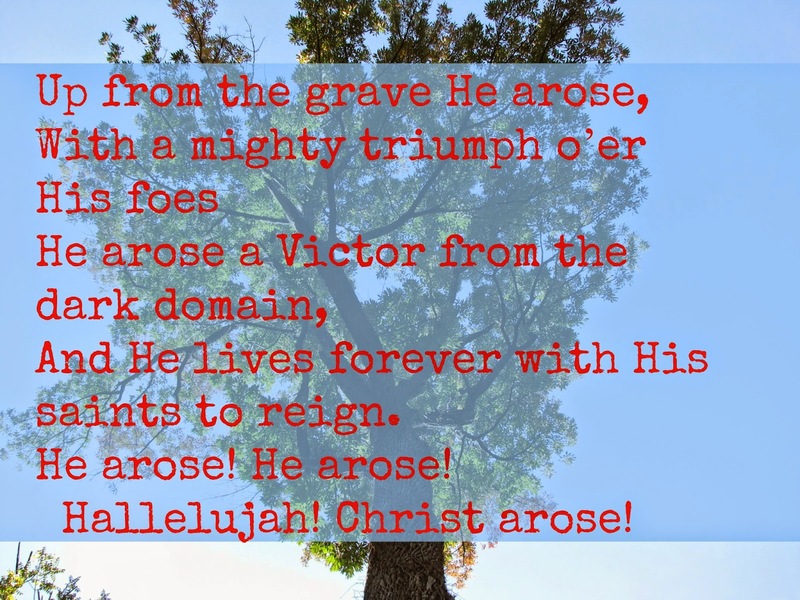 Thankful Thursdays - 4/17/14 - My printer! It's a palindrome Thursday 4-17-14! It amazes me that we have the technology to scan, print, or make copies at home. I remember as a kid thinking it was a big deal to get to see a Xerox machine! In school our teachers used the purple "Ditto" machines. Who remembers those?! Another thing I'm thankful for? Printing over the Wi-Fi! I just sent a Dewey Decimal list to the printer for Arlene to take to the library with her, and I didn't have to get out of my chair. That is awesome! Spring is slowly creeping into the area. 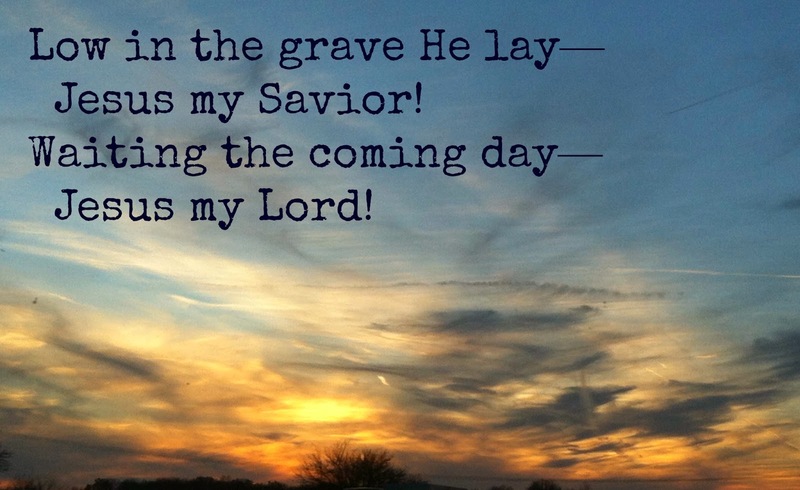 That's another reason to give thanks! Have a lovely weekend - go plant something! How many time this week have your kids asked you "Why?" That happens a lot around here, but I have a new solution, DVD's from Curiosity Quest. For this review we received two of Curiosity Quest's DVD Combo Packs: Swimmers of the Sea, about Penguins, Sea Turtles, and Salmon, and Produce, about Mushrooms, Cranberries and Orange Packing. Either of these DVD Combo packs can be purchased for $24.95 each. These DVD's are geared for ages 7-14, but you and your older children will probably enjoy them too! Arlene and I watched the DVD's together over a couple of days. After we were done, Arlene summed up Curiosity Quest as "Dirty Jobs for Kids!" We both learned a lot while watching the episodes. We began the Swimmers of the Sea DVD with Salmon. Each episode is about 30 minutes, giving you about 90 minutes of viewing on this DVD. Joel Greene is the host of the Curiosity Quest series, and each episode's adventure begins with a question from a viewer, or several viewers who write in with questions about what they're curious about. In the Salmon episode, Joel and his crew travel to Alaska to learn about the 5 types of salmon that breed in Alaska. The episode takes Joel to several locations around Juneau where the Alaska Division of Fish & Wildlife have hatcheries. 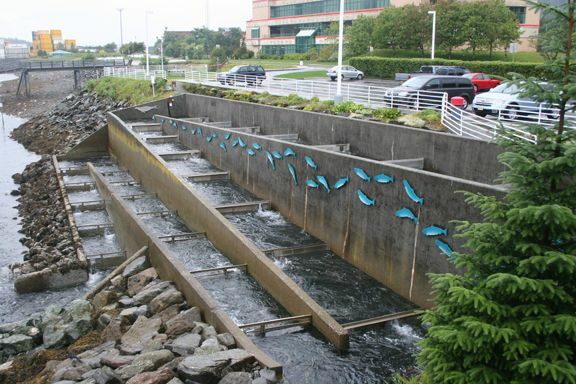 The hatchery system exists to make sure there are always enough salmon available for commercial fishing. This ensures that we can go to the grocery store or a restaurant and always have salmon available. Joel learns a lot about the salmon that live in and around Alaska, including a mnemonic to remember all 5 types of salmon. Along the way, viewers learn about each step from when (and why) salmon spawn in the freshwater streams of Alaska, through their birth, growth, and release into the ocean until they come back to spawn and finish their lives. I learned a lot about salmon, and really appreciate being able to visit my local supermarket and purchase salmon for dinner. After all the salmon go through in their life cycle, it makes me thankful to just purchase the end product ready to grill for dinner. In the next episode we watched, Joel went to the Aquarium of the Pacific to learn about Magellanic Penguins that normally live in a temperate climate. First thing in the morning, Joel learns about Penguin vitamins and the types of fish penguins eat. Joel and the viewers get introduced to the penguins that live at the Aquarium and Joel gets to help with the morning feeding. Along the way there are "Fun Facts," definitions of terms, and "Man on the street" type questioning of people of various ages. You'll earn what a molt is, what penguins eat, and how they are social birds that live in groups. Joel also learns that penguins can swim up to 5 miles per hour, and that they have solid bones, unlike flying birds that have hollow bones. 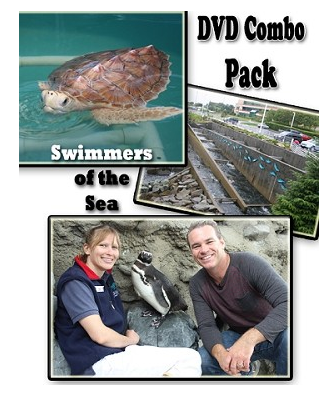 During the Sea turtle episode, Joel takes his viewers to Marathon, FL, to the Sea Turtle Hospital. Once again the morning starts with Joel learning about the various types of turtles and what they eat. 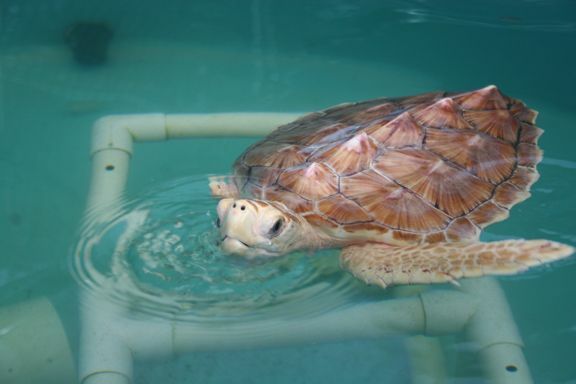 At the Turtle Hospital they rehabilitate sea turtles that have been hurt in the wild. Some of the turtle have crazy names because the person who rescues them gets to choose their name. Because all seven species of Sea Turtles are on the endangered species list, Joel doesn't get to touch any of the turtles, but he does get to help feed a couple of them. The Turtle Hospital has a rehabilitator's certificate from the Federal Government which allows them to help the turtles. This episode includes tips on animal husbandry to help you know how to help sea turtles by choosing to turn off your lights during hatching season, or purchasing the correct kind of fish hook. If you pay close attention, you'll learn that the largest sea turtles can swim up to 30 mph! The second DVD we received was Produce. Joel begins by learning all about cranberries. Cranberries don't grow in water, but water is essential for harvesting. The fields are flooded to allow the berries to float to the surface for ease in harvesting. Joel learns that cranberries are buoyant because they have 4 hollow chambers. Good quality cranberries bounce in the sorting house. You'll learn the difference between first quality, second quality or small berries, and 'slush berries' that become organic chicken feed. 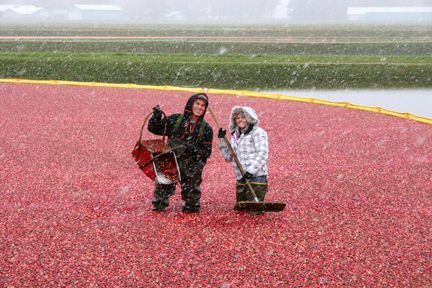 This episode is about 50 minutes, and you'll watch Joel visit two different cranberry farms and learn how cranberries are grown, harvested, cleaned, sorted and packed. 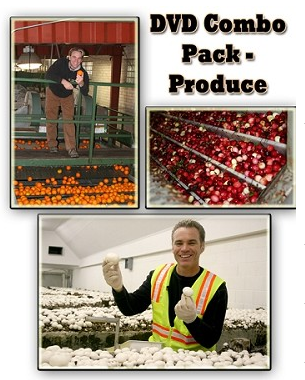 The second episode on the Produce DVD is all about oranges and lasts about 30 minutes. Joel begins the day learning how to pick oranges, and the care it takes to clean all 400-500 oranges off of a tree and put them in the bin to send to the sorting house. In the sorting house you'll join Joel as he learns how each orange is cleaned, graded and sorted by size. Although a lot of the work is done by machines, I was surpassed to learn how much of the inspection is done by hand. This insures that a bad orange doesn't get mixed in and damage the good ones on the way to the store. Did you know that the first orange tree seedlings came to America in 1493 with Christopher Columbus? Neither did I. The final episode on the Produce DVD is about mushrooms. It is an amazing process to see the care that goes into preparing the compost that becomes the growing soil for mushrooms. I never realized they need to sterilize the growing medium so that mushrooms are the ONLY fungus that grows. As the day goes on, you may find yourself laughing along with Joel as he realizes just how slow he is at picking mushrooms and just how skilled the pickers are. Have you ever seen tiny mushrooms? They only take a couple days to grow market size, and you'll learn how they harvest selectively to allow further mushrooms to grow in the same growing area. A funny thing happened right after we watched this episode the first time. I purchased some portabella mushrooms at the store, and in the package with the two large mushrooms was a inky-dinky mushroom. Arlene joked that it must have gotten picked by accident by someone like Joel Greene while they were just learning. We really enjoyed all of the episodes on both DVD's. These are the type of show where you'll watch them more than once, and you may find your children asking if they can watch them again when their friends come over to visit. These videos answer a lot of "Why" questions, and they're entertaining, so you should feel comfortable with your kids watching them. Remember that they're geared for ages 7-14, but don't let that limit you. Your younger and older children will enjoy them too. I learned a lot from watching the six episodes we received. There are a lot more episodes available from Curiosity Quest, as well as some membership options that will save you money if you're wanting to get several episodes. Overall, I give the Curiosity Quest episodes an A grade, and I can understand why they have earned awards. While talking to the viewers, Joel never talks above the level the children should be able to understand. 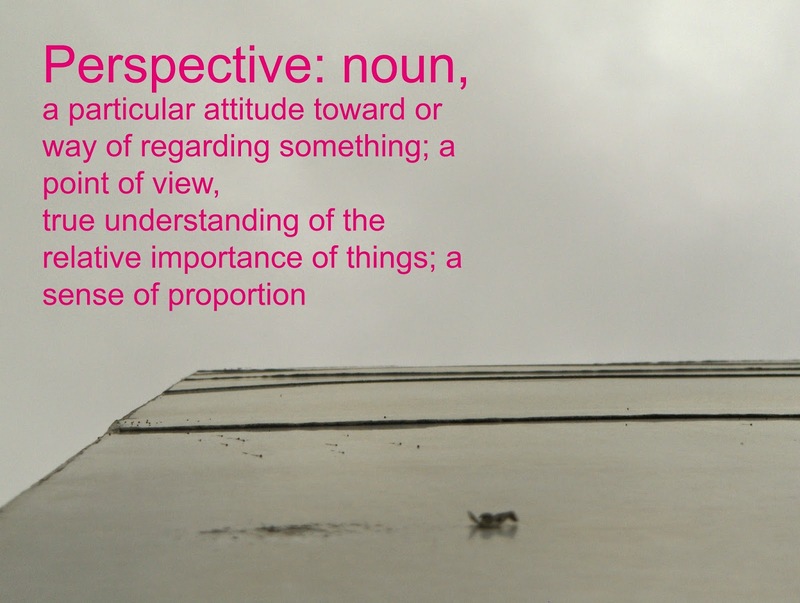 Complicated words or terms are either defined and/or explained through actions. Each episode includes the "Fun Facts" and 'kid on the street' interviews. You can visit Curiosity Quest on Facebook or see how the episodes are made by watching their videos on You Tube. Find a reason to get yourself some Curiosity Quest DVD's soon - you'll be glad you did! Sometimes it's hard to show thankfulness, not because you don't see the blessings around you, but because something in your life is particularly hard. I can understand that. Kurt had his gallbladder out on Tuesday. I am SO thankful for his surgeon, and all the great nursing staff, but my family might tell you I haven't seemed thankful this week. So many things to attend to, so much to think about, so many times & things that need attention. Yes, I've had moments when I wasn't pleasant, but I'm really trying to show more thankfulness. I think the sunshine today helped me a little. I felt like the important & the urgent items BOTH got some attention today. Kurt is doing better, and I'm getting used to being his nurse at home. Perhaps you've had a rough week. I've had friends this past month who were/are struggling with broken vehicles, flooded basements, deployed husbands, financial struggles, and family deaths. I try to remember to pray for them, as I know so many of them have lifted us up in prayer & the comfort it brings. Each week, each day, each moment, we have so much to be thankful for. Let's lift each other up, let's show our thankfulness to God for all His blessings. Let's remember a kind word and a smile CAN make someone else's day better! Even in our struggles, let us choose to be thankful! I think a lot of us homeschooling parents feel like there are one or two things missing in our children's education. Maybe it's not a core subject, maybe it is. There are times when life gets so busy or strange that I wish we could have spent more time on a particular subject than we were able. These are the topics that I hope to 'cover again' before the girls get out of High School. One of those is Physical Science. There just aren't always enough hours in the day for me to sit and do experiments with Emily and Arlene. 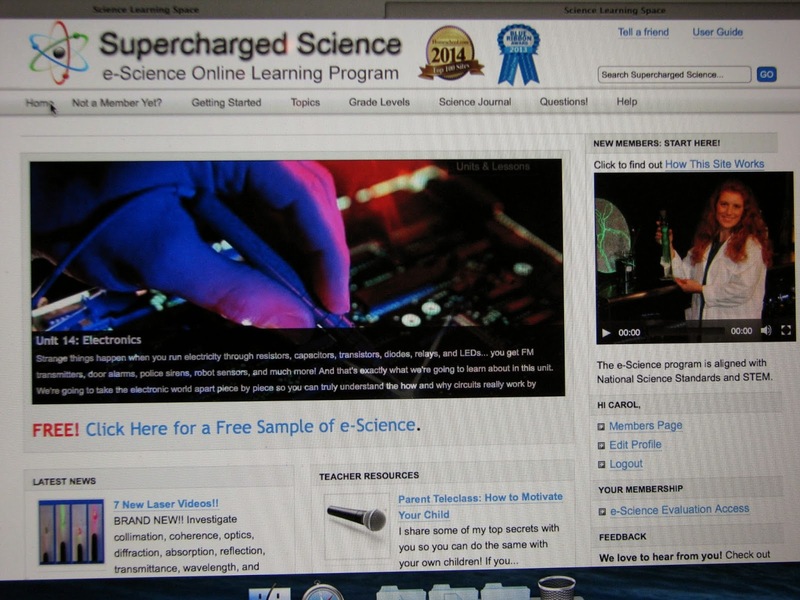 That's why I was intrigued by the opportunity to review the e-Science Premium Membership from Supercharged Science for the Schoolhouse Review Crew. The girls (with a little help from me) have been in control of their own Science class for the past 6 weeks during this review, and they've been having a lot of fun! Supercharged Science is the brainchild of Aurora Lipper, a former NASA Rocket Scientist who realized that her college students at Cal Poly State University were bored. Aurora realized that younger students were not being taught science through experience and experiments, but rather through boring lessons. Thus when they got to her classes, they just weren't expecting to enjoy science. She set out to teach kids physical science that would be fun. Hoping to improve science class from the beginning. These lessons are definitely fun. Each unit has multiple lessons, with Aurora teaching the basic principle through a video lesson. Then there is a section for the student to read (or for you to read to/with your younger students.) Then come the experiments. 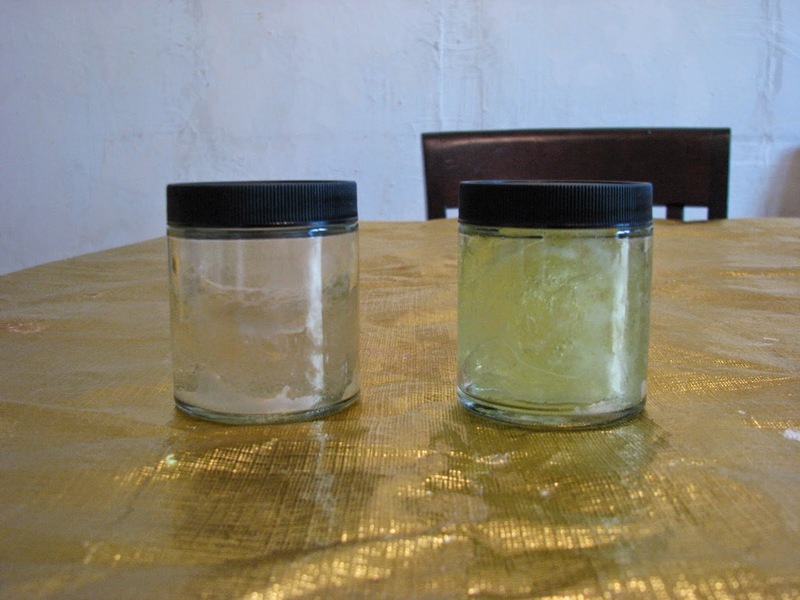 Many lessons have multiple experiments, many of which use basic household items, or items you can purchase at your local big box or electronics store. There is a nifty Shopping List you can print out for each Unit, allowing you to go around your house looking for supplies, then determine which items you will need to purchase. If you want to know specifics about each experiment, you can look at individual experiments for their supply lists. Some Units have long supply lists, but if you look them over, you'll see how Aurora uses many common things to teach great science concepts. 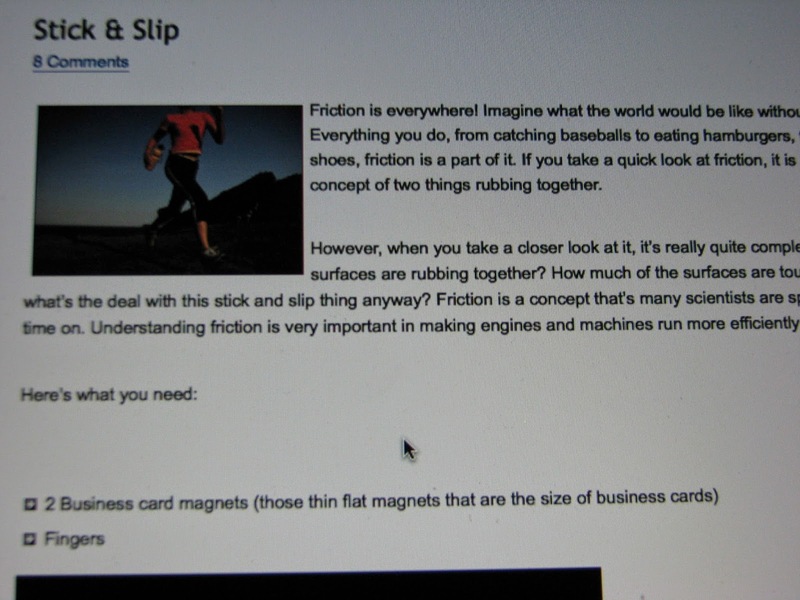 In Unit 1, which covers Force, Gravity, & Friction, there were only one or two things we didn't already have. However, if you're planning on doing Units 10 (Electricity) or 14 (Electronics), you might want to have a Radio Shack nearby! 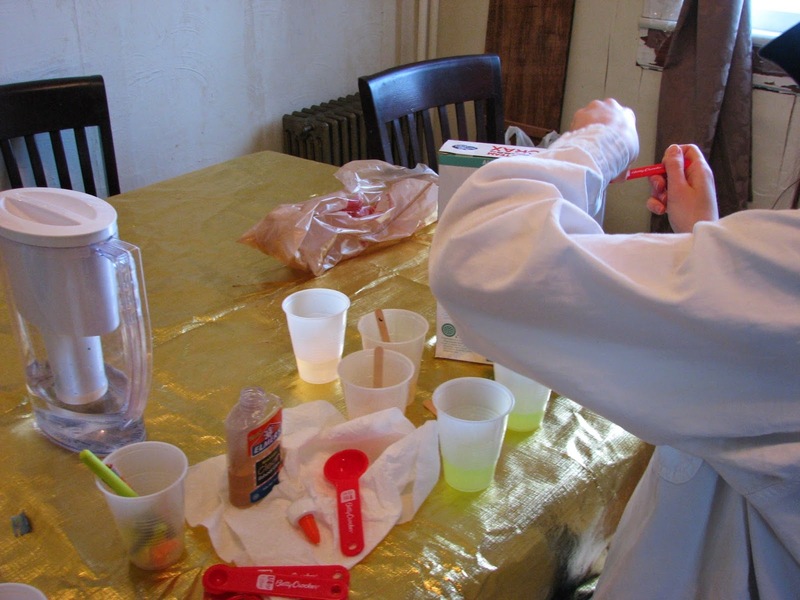 You don't have to do all the experiments, but expect that your children will want to do at least MOST of them, after all, they're FUN! The e-Science membership gives you access to one or two additional units every month of your membership. That gives you about 60-80 new experiments to try every month. While a lot of these are geared for K-8th grade, there are several of them geared towards High Schoolers, like the Unit on Astrophysics! Even in the experiments geared for Elementary or Middle School students, many of them have a link at the bottom of the page for advanced students to click to get High School level lab worksheets, which include more in-depth learning on each subject & require more math. That means you'll start with a sizable chunk of science to cover in just the first month. You can do as many or as few of the experiments as you want, but I think you'll really enjoy Aurora's video lessons. Arlene mentioned that she really likes the teaching videos because then there is not so much reading to do each time. Plus, when Aurora explains the science concept in her video, the student has a better idea of what to watch for during their experiments. Too many times in the past, Arlene was frustrated by different science books that just didn't give specific enough instructions for her to understand HOW to do the experiments. 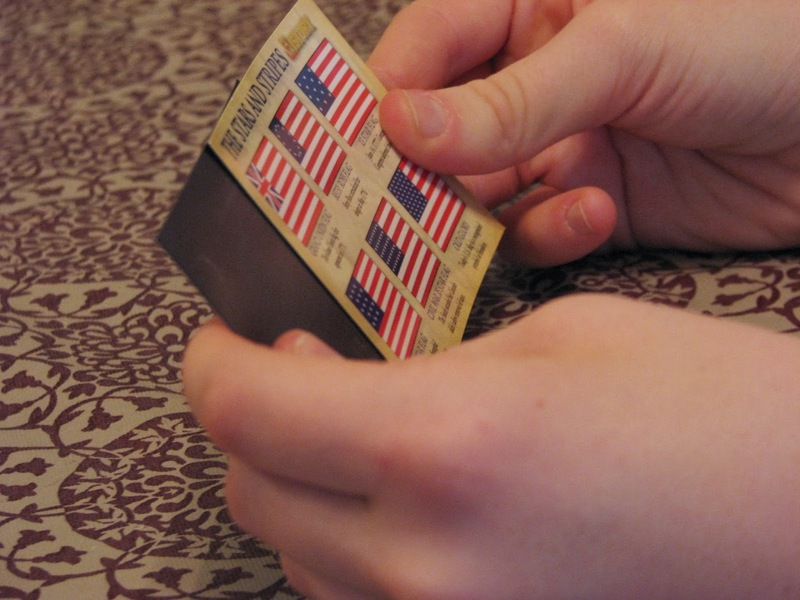 I liked that for your older students, they can take charge of this and do it almost all on their own. This was particularly helpful for us this past month when Kurt was sick. The girls were able to take the laptop into the other room & complete science class on their own. When you read through the Supercharged Science website, you'll read (& hear) repeatedly that this curriculum does NOT require you to know about science. That is awesome for me, because my science focused on Biology, not Physical Science, and the last time I studied Physics was 20+ years ago! 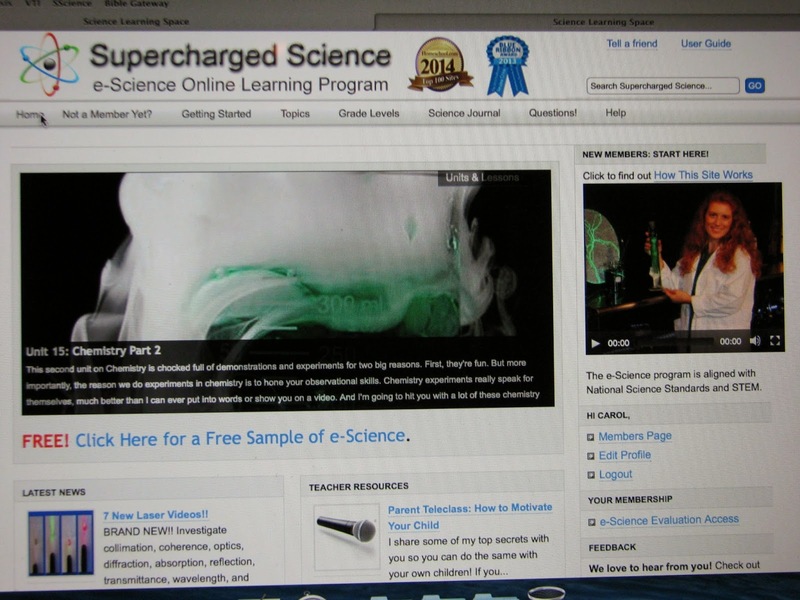 Supercharged Science intends to teach students at least 10 of the 18 main principles in Science. The other eight are college level, which will be much easier to learn if your student grasps these 10 now. Some great features that everyone can access as soon as they sign up include Unit 0 (especially great for the parents, although you'll want your kids to watch it for a basic overview of principles like Newton's first Law of Motion and the First Law of Thermodynamics) an overview of the Scientific Method, and a terrific section about how to make and use a Scientific Journal. This Science Journal has helped the girls remember what they've done during their experiments, and gives them a place to write any notes they might want to make from the videos. 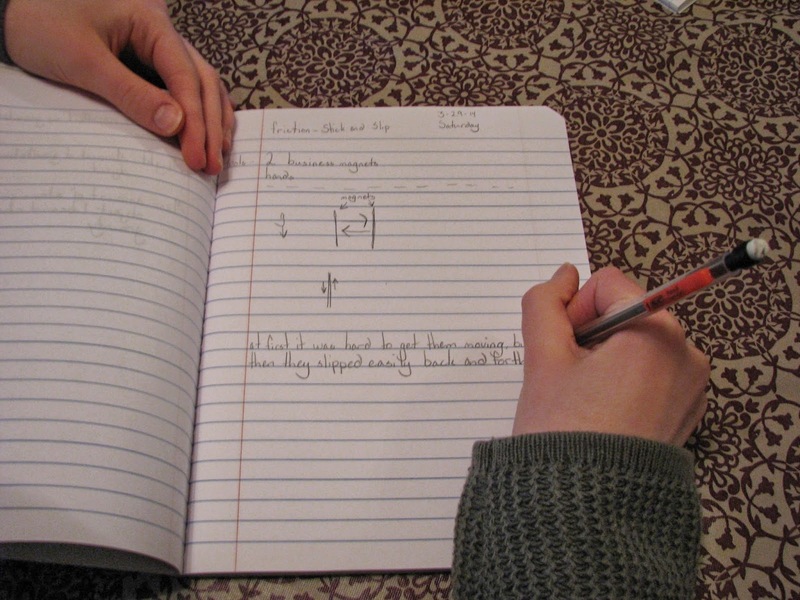 Be sure to watch this video WITH your students, and help them get started on their Journal. Many of these experiments work best with 4 hands, so having your students work together fits in really well. 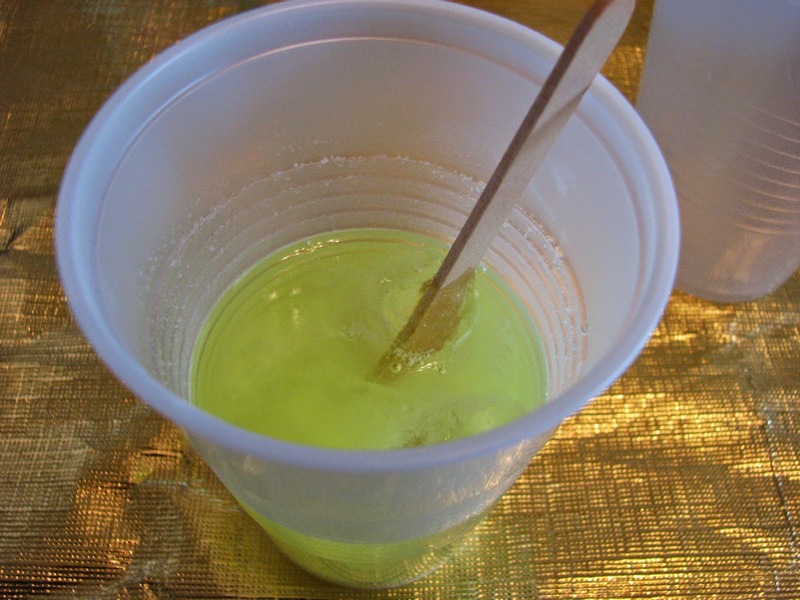 If you have a single student, or only one older student, expect them to need some help with some experiments, especially those that use a stopwatch! For the review, our girls started with Unit 1, learning about Force, Gravity, and Motion, and then I let them pick and choose what to do next. You can follow a path Unit 1-Unit 20, or you can skip around through whatever units you have available based on how long you've had your membership. I can definitely see using the entire curriculum over 2 or 3 years, but you can choose just to do specific units based on your needs. The staff at Supercharged Science is good about responding to your questions and are really helpful. On the website, they have Conversion Charts where you can see which units line up with 20 of the most popular homeschool science curriculums. That way, if you already have a favorite, but it seems lacking in labs/experiments, you can match them up. If your science curriculum isn't listed, you can email them a Table of Contents and they'll make up a conversion chart for you. We've been using e-Science for the girls, and plan on continuing it as our main science curriculum for the rest of the year. The girls are enjoying it, and I am hearing them talk about scientific principles at random times without any prodding. If your students are in grades K-8, you can use the e-Science program for $37 a month. If you're wanting to have access to all the older student experiments and lab sheets, the e-Science Premium Membership costs $57 a month. I know, that seems like a lot of money, but I've not seen another science curriculum that covers this much. I might suggest you plan to set something else aside for the year that you use Supercharged Science, as you could do ALL the units and get 2 years' worth of science done in one year. A true plus to this membership is that you can use one membership for the WHOLE family. So yes, your 2nd grader can learn about Motion, your 6th grader about Matter, and your High Schooler can learn Astrophysics all at the same time. How many Moms or Dads have time to teach all 3 of those in one year?! If you used the all-ages e-Science Premium Membership for 8 months, it would cost you $456. 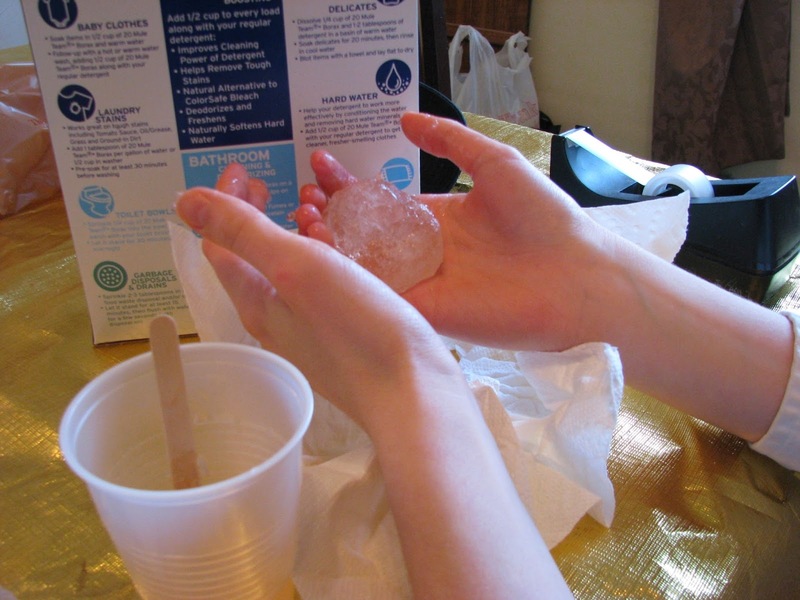 How much did you spend on science for your children this year? Not all of e-science is Physical Science though, there are 2 Units on Chemistry, 2 Units that cover Life Sciences/ Biology, and one unit on Earth Science. So what did we think overall? This is a really cool science curriculum. I wasn't sure what to think about the claim that it doesn't teach either Creationism or Evolution, but it really doesn't. Since so much of this is based on current, observable science, it stays focused on scientific principles and doing experiments. That means I can heartily recommend this to anyone who wants their students to get a quality science education. Our girls (15 & 13) tended to work on this for 2 hours at a time, every other day, as opposed to an hour each day. I think that plan works better for older students, as it gives then time to complete a lesson well. 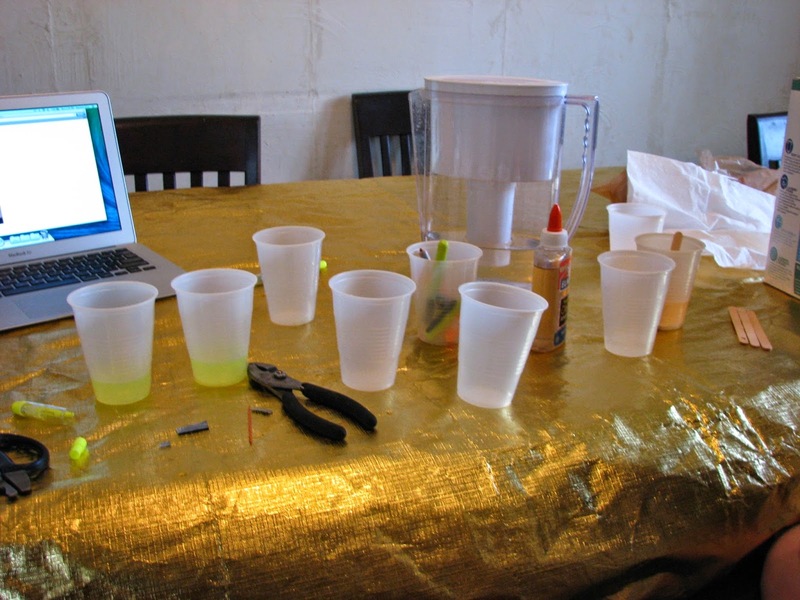 They could watch the video, read the extra material, do their experiment and record it in their journal. That's one of the joys of homeschooling- setting your own schedule! 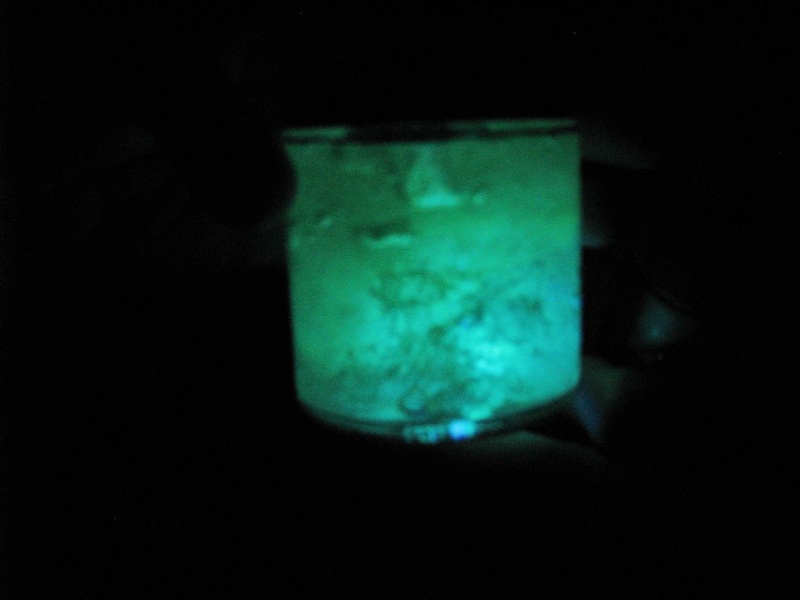 The girls' favorite experiment was making Glowing Slime! 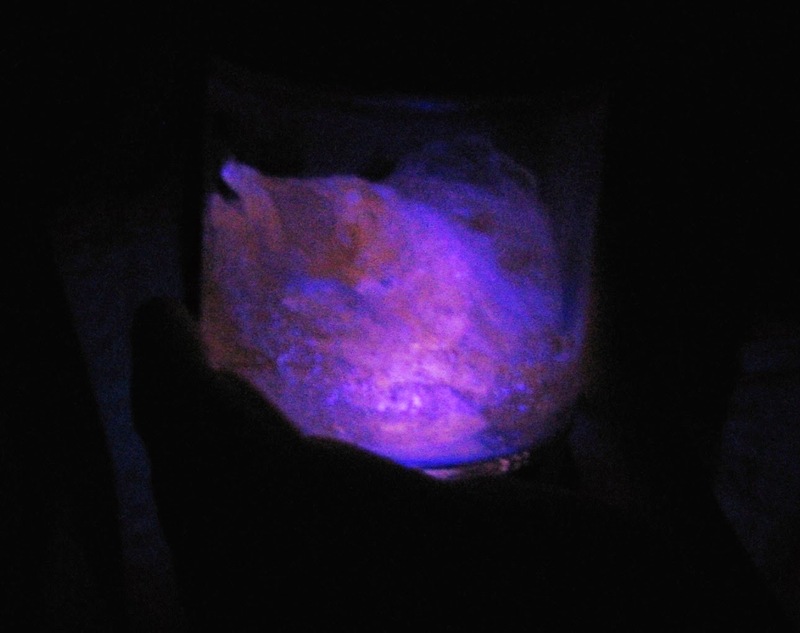 Emily has a Dr Who sonic screwdriver that has a black light on one end, so they've been busy turning fluorescent highlighters into glowing slime. It took them a while to get set up, but because the video was so informative, everything worked right the first time! Now they're in our fridge in their own little jars. I'm really impressed by how confidently and correctly the girls did this start to finish on their own. The only thing I had to do was buy them some Borax and clear glue. We give Supercharged Science two thumbs up. You can follow Supercharged Science on Facebook, Twitter, or Pinterest. At the time of posting, Supercharged Science is offering a special of $1 for the first month. If you're still unsure, you can try a 5 lesson mini-program for free. Click below to read other reviews from the Crew.